Ford Motor Company introduced its Super Duty line of F-Series pickup trucks in early 1998 for the 1999 model year. Weighing more than 8,500 pounds (3,900 kg), these trucks are a larger and heavier built series pickup with heavier-duty body-on frame steel ladder frames, axles, springs, brakes, transmissions, more powerful engine and heavier and bigger components with much higher payload and towing capacities than the traditional light duty Ford F-Series pickups. 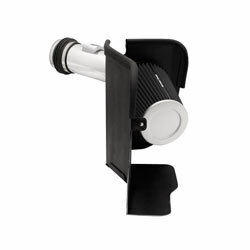 Spectre offers the 9973K air intake kit for 2003-2007 Ford F-Series Super Duty and Ford-Harley Davidson Super Duty pickup trucks as well as some Ford Excursion SUVs. 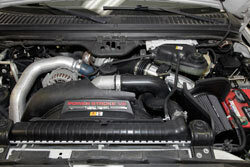 The air intake offers an estimated boost of 10-horsepower at 2550 rpm and includes a washable and reusable black Spectre non-woven synthetic low restriction air filter, polished aluminum tubing, a black powder-coated heat shield that prevents hot air from entering the intake inlet, and stainless steel clamp. Spectre also offers the Spectre Accucharge precision air filter cleaning and oiling system that is specially formulated to recharge Spectre HPR replacement and racing air filters so that the filters can be reused over and over again.